To start with this new section of my Blog, where I intend to share some information and tricks concerning African fauna photography, I would like to talk about something that we all can get (but in variable amount from one day to another), whatever is our photography competence, I mean : Luck. Besides all technical and naturalist considerations and tips, luck is a powerful contributor to success in wildlife photography. The story of this Hippo picture is simple almost trivial. Middle of morning in Serengeti National park, close to Seronera. We reach Retina Hippo Pool where Nile Crocodiles (Crocodylus niloticus) and Hippos (Hippopotamus amphibius) are competing for the best place. This makes them very nervous. Our 4x4 vehicle took position on the edge over a waterhole where a dozen of Hippos where sitting half immersed. I had just time for standing up before I perceived a movement in my peripheral vision. I turn a quarter turn, took a sequence of photos in burst mode, in a flash without aiming. No time to wonder what am I shooting, no time to fine tune focus or framing, 9 out of 10 chances to eventually get a quite poor photo. After this first sequence, I kept focused on the scene to complete the series. 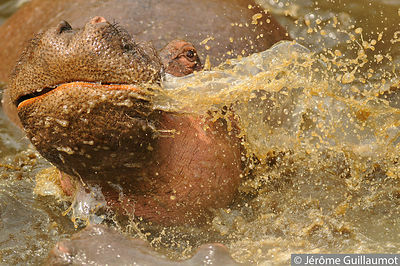 I eventually understood what I was photographing : a fighting between 2 hippos. The conflict went on for a while and I continued shooting this action scene. You can also subscribe to my Newsletter here.